Our office has the latest in materials and technology to provide the best care for your endodontic needs. We use the most current techniques to ensure that you are as comfortable as possible during each procedure. We are committed to staying abreast of the changes in the dental field and incorporate exciting advances and new techniques into our practice. We are continually updating procedures, adding newly available equipment and attending continuing education seminars. Using this highly specialized microscope has revolutionized endodontic treatment. 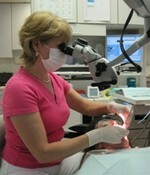 Now endodontic procedures can be performed under high levels of illumination and magnification. These enhancements have made a great impact on the visualization and evaluation of each procedure and the use of fewer radiographs. This specialized equipment ensures our instruments are properly sterilized. Our office abides by all the standards established by the Center for Disease Control (CDC) and the American Dental Association (ADA) for sterilization of dental equipment. We treat all our waterlines and the water that flows through our handpieces. The oxidizing agent used kills bacteria and prevents biofilm from accumulating in the waterlines, which results in water purity that exceeds the stringent requirements set forth by the CDC and the ADA. Our patient's x-rays and photographs are able to be viewed on the computer screen in a matter of seconds. Digital radiography also significantly reduces the amount of radiation to our patients by as much as 90%, as compared to traditional radiographs. We have also installed a digital cone beam scanner (CBCT) that enables us to view the teeth and jaws in 3-dimensions, unlike the limiting 2-dimensional view of traditional radiographs. We are proud to be the first endodontic office in the state to employ such sophisticated technology and feel this takes the quality of our care to an even higher level. Our office is paperless. Thus a digital record is created for all patient information, images, and radiographs. All records are stored on a secure server with multiple back-ups. This enables us to diagnose and to treat our patients more efficiently and to communicate more effectively with both the patient and the referring dentist. Our referring dentists have the ability to securely log onto our server and view their patients' images and notes relevant to their treatment. This technology promotes our goal of clear and detailed communication with the patient and the referring dentist. Our patients can also save time in our office by pre-registering to prepare their paperwork prior to their appointment. Simply make an appointment, request an I.D. number and password and complete your paperwork online through this website. This process is simple to use, safe and secure once you log in.